Many foreign nationals all over the world have inadmissibility issues when attempting to enter Canada. The more common inadmissibility is due to criminality. When trying to overcome criminal inadmissibility, it can become overwhelming and nerve-racking. However, thankfully, there are two significant solutions for these situations. A foreign national with criminal inadmissibility can either apply for a Temporary Resident Permit or a Criminal Rehabilitation. This depends on several factors. 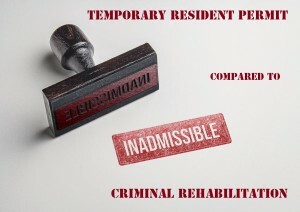 Therefore, in this article, I will address the comparison between a temporary resident permit compared to a criminal rehabilitation as well as important information about both applications. The Temporary Resident Permit was made for foreign nationals who have criminal inadmissibility, but have not yet been qualified or eligible for a Criminal Rehabilitation. As a result, many foreign nationals who apply for a Temporary Resident Permit have a significant reason for why they would like to or need to enter Canada. The permit is temporary, as the name indicates, therefore, any foreign national who would like to enter Canada may only do so temporarily. The authorization period of a Temporary Resident Permit is entirely authorized by the Immigration officer assessing the application. The permit can either be issued for one day or for up to three years. This also depends on the reasoning for entering Canada and how long the foreign national will need entry into Canada. Therefore, in most cases, the Immigration officer, if they approve the permit, will issue it for the duration of the specific time frame requested from the foreign national. Keep in mind, they can also authorize less time than the original request. One major benefit of applying for a Temporary Resident Permit, depending on where you are located in the world, is that you may either apply at a Port of Entry or at the Canadian consulate. If you are applying at the port of entry, you will receive a decision on the same day and most of the time it will take an hour or two at most. The only downfall to this is that the Immigration officer may also deny your entry into Canada and then you would have to return to their country. Please note that applying at the port of entry is most accessible for Americans as it would be very tedious if a foreign national from anywhere else were to apply at the port of entry. On the other hand, a foreign national can also apply for a Temporary Resident Permit at the Canadian consulate. This process usually takes significantly longer – up to 8 to 12 months. However, Immigration officers often highly value foreign nationals who apply at the consulate because it shows Canadian Immigration that the foreign national is very serious about overcoming their inadmissibility. When applying for a Criminal Rehabilitation, you can only apply at the Canadian Consulate. Unfortunately, applying at the port of entry is not an option. The processing time for a Criminal Rehabilitation application is relatively the same as applying for a Temporary Resident Permit at the Canadian consulate which is approximately 8 to 12 months. It is essential that you have taken all the aforementioned information into consideration, especially if you are researching whether you qualify for a Temporary Resident Permit or a Criminal Rehabilitation. If you would like to apply for either of these applications, it is extremely important to note that these are difficult applications to pursue on your own. Therefore, it is highly recommended that you seek out professional and experienced help prior to submitting a Temporary Resident Permit or a Criminal Rehabilitation. Here, at Akrami & Associates, we work and have experience with many different immigration matters. We have helped many of our clients overcome their criminal inadmissibility by applying for a Temporary Resident Permit and/or a Criminal Rehabilitation. If you believe that you may be eligible to apply, please feel free to contact Akrami & Associates at our office at 416-477-2545 for more information or if you would like to book a consultation with an immigration professional for more advice. At Akrami & Associates, there is always a way!